The autonomous technology gap between Ford Motor Co. and its rivals from Detroit and Silicon Valley can be measured in years. Yet even a company playing catch-up in the race to turn self-driving technology into high-margin businesses is drawing interest from outside investors, an indicator of just how much money is pouring in. “I’m really excited about what I’m hearing and seeing in terms of interest with many credible entities,” said Sherif Marakby, the Ford veteran who spent a year at Uber Inc. and now is CEO of the newly formed Ford Autonomous Vehicles. 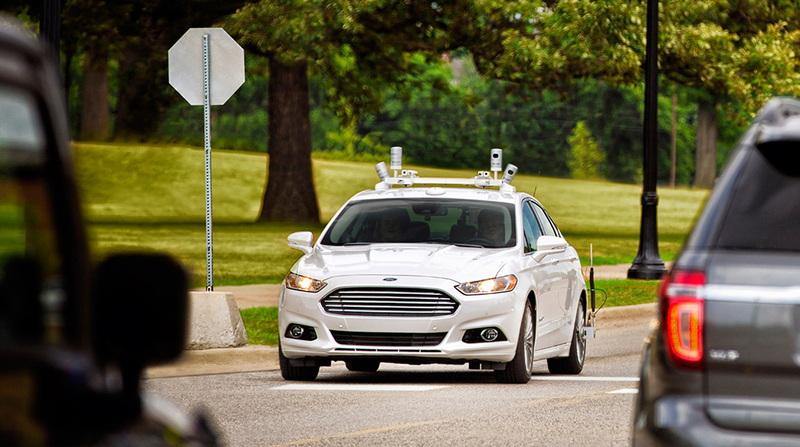 Ford moved last month to reorganize its self-driving car efforts into one distinct unit. The announcement on July 24 left open the possibility of an outside investment such as the $2.25 billion that General Motors Co.’s driverless business received from Japan’s SoftBank Group Corp. in June. The shift was overshadowed the next day by disastrous quarterly earnings that sank Ford’s stock. Yet serious investors are sniffing around Ford AV, Marakby said in an interview this week, enticed by a “one-stop shop” strategy that involves robot taxis and driverless delivery slated to hit the streets in 2021. That’s three years later than Alphabet Inc.’s Waymo, which will open a robo-taxi business in Phoenix later this year, and two years after General Motors Co., which plans to deploy self-driving Chevy Bolts in a ride-hailing service in 2019. Old-line automakers have struggled to get credit from Wall Street for the billions they are lavishing on developing self-driving cars. That’s why they have started to hive off autonomous activities into distinct units that can attract outside investment and even be spun off. Daimler AG, for instance, recently unveiled a Mobility AG separate from its Mercedes-Benz and commercial truck units. GM, whose shares soared after attracting a SoftBank investment in its self-driving car unit, Cruise Automation, now is considering a public offering of shares in a spinoff. A profit warning last month sent GM’s stock back down, highlighting how its high-flying autonomous activities are tethered to the gyrations of the cyclical car business. Indeed, Wall Street investors have shown little interest in Ford’s stock, which fell to a six-year low after second-quarter profits plunged and the company revealed an $11 billion restructuring that could take five years. By setting off its autonomous-vehicle business in an LLC, Ford hopes its self-driving strategy will be assessed on its own merits. Self-driving cars are expected to upend the transportation industry and usher in a business worth $7 trillion by midcentury, according to a report last year by Intel Corp. and Strategy Analytics. Automakers, accustomed to modest profit margins of less than 10%, believe that removing human drivers from taxis and delivery trucks offers the prospect of generating returns that exceed 20%. Those who get it right will have a prosperous future. Those who don’t may not have a future—and so far, Ford has been grouped with the laggards. Ford has long argued that it is planning something far more expansive than its rivals. The vision includes as many as 100,000 driverless cars — with no steering wheel, accelerator or brake pedal — operating in multiple American cities to deliver people and packages around the clock. Analysts say that sort of maximum utilization could generate profit margins of 20% or more. Marakby hopes the creation of the new unit will help drive home the benefits of Ford’s different approach, as well as its seriousness. For starters, Ford said it will spend $4 billion on autonomous vehicles over the next five years, including the $1 billion invested in its self-driving technology partner, Argo AI. If Ford can convert that interest into investment, the automaker’s long-suffering shareholders finally might see some upside in a stock that is down almost 20% this year and off 42% since turnaround artist Alan Mulally retired as CEO in 2014. Marakby, who helped Uber get its self-driving effort off the ground as vice president of global vehicle programs, said the new organization will allow the automaker to accelerate to “Silicon Valley decision-making.” But Ford has no plans to move up its 2021 launch of its autonomous vehicles, which are being tested in Miami, Pittsburgh and the Detroit area. Self-driving Fusions are ferrying people, packages and pizza around Miami, part of Ford’s partnerships with Domino’s Pizza Inc. and Postmates.